Whether I’m traveling on business or with the family, I like to load up on TV shows and movies for the plane. My usual go to sources for streaming videos—Netflix, Amazon and HBO Go—aren’t available when we’re in the air or, often, even in the car. So I was intrigued by PlayLater, a service that lets you record streaming video services and take those recordings with you for playback on your smartphone, tablet or PC. PlayLater works with 55 channels, including the popular movie channels I named above (Netflix, Amazon Instant Video and HBO Go), as well as many or the major over-the-air and cable networks, such as ABC, NBC, CBS, PBS, Discovery, Disney, EPSN and Food TV. Finding and recording shows is straightforward for most sources. 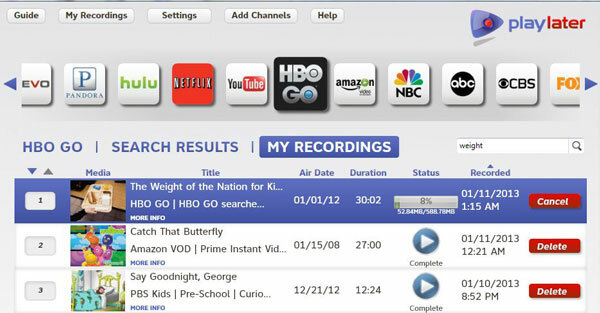 You simply select the network, find the show and episode you want to watch and hit the record button. Like other DVRs, PlayLater records video in real time, meaning a 30-minute show takes 30 minutes to record, or save, to your computer. Once the recording is complete, you have an MP4-format video that you can view on any device that can play an MP4 file, including iOS and Android devices. However, you can't watch the video while it's recording and you can't record more than one video at a time. Also, because PlayLater is recording in real time and doesn't have access to the original movie file, the file size of the recordings is very large—assume 250-500 MB per half-hour of recording. For most subscription services like Amazon Instant Video and Hulu Plus, you'll need to be a subscriber to access the content. You simply supply your account name and password in the PlayLater settings and you're good to go. However, with HBO Go, you're required to open “settings” and sign in through a pop-up window—every time—before you can record. If you forget, you’ll see the sign-in screen in front of the video content for the duration of the program. The one snag I ran into during testing was with Netflix. I was unable to record from Netflix, even after trying on multiple PCs and with multiple accounts. So if Netflix is important to you, be sure to test it out during your free one-month trial of PlayLater before you subscribe. For Android devices, transferring your recorded shows is easy. You simply connect your device to your computer and then drag and drop the files into the default folder for videos. For instance on the Nexus 4, it’s conveniently labeled “videos.” When you open your device’s video player, your shows will appear in the list. If you have an iOS device, you can install the PlayLater app (free in iTunes) and sync your recordings through iTunes . You just need to connect your device, go to the “Apps” tab and add the files in the “File Sharing” section. And video playback is enhanced in the app by 15 second skip forward and 5 second skip back buttons. 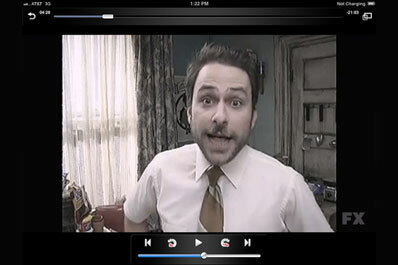 PlayLater will record in whatever resolution the video is streamed, so you can record in HD when available. However, video quality is highly dependent on how good your Internet connection is. Many streaming services will reduce the quality of videos to accommodate a slow connection. So HD, or even standard definition streams, can look pixelated and noisy at times—even within one show. On the whole, though, I found the quality to be acceptable to good. Since PlayLater is recording a stream, it also records things like black screens as a video loads, as well as ads. If you find them bothersome, you can always fast forward or go in and edit them out with video recording software. You can purchase a lifetime subscription to PlayLater $39.99 or pay $19.99 per year. If you travel and want to watch video where there’s no or slow access to the Internet, PlayLater provides a very cost-effective alternative to purchasing content. You won’t get the same quality as you would if you purchased a show or movie through iTunes or Amazon, but the quality is certainly at least watchable, and often very good. For $39.99, it's certainly a service I'll be using. Netflix is analog ... probably reason for your problem. All streaming services are digital. This sounds intriguing to me. Is closed captioning possible with PlayLater? I tried looking at videos using NetFlix on my Kindle Fire and was very frustrated to realize captioning wasn’t available. I watch all TV with captioning. Would it be available for mainstream TV programs on PlayLater? Closed captioning would only be available if it’s available from the video streaming service (i.e. 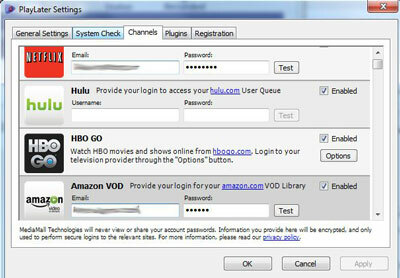 Amazon, NBC) and turns on automatically when your account is logged in. You’d want to test it to make sure it works within that one-month free trial. Did Playlater works with a Brazilian Netflix Account? The app has come a good long, long way from when this review was written; I still have pixelation issues with it especially when I mirror or cast it to the Roku but it continues to play that way when I use a HDMI cord from my laptop to the big TV nearby. I believe they did a major overhaul of the software two years ago and I can’t complain. I jumped on board with the lifetime subcription about a year ago. I wish I’d use it more than I do; Kodi came out with v17.x Krypton and it’s excellent once you get the ins and outs figured out. I’m always asked why I don’t use a DVR and I say to them; why, it’s available via Internet Stream at anytime. If data usage and limitation are an issue PlayOn and recording streams is definitely the solution of choice.